Laparoscopic fundoplication in children under 5 kg is still debated. Our objective was to evaluate the safety and efficacy of laparoscopic fundoplication (LF) in children under 5 kg. We reviewed the cases of 96 children treated by laparoscopic fundoplication between 2005 and 2014. Thirty-five patients had a weight of 5 kg or less at the time of LF (Low Weight Group) and 61 patients had a weight between 5.1 and 10 kg (High Weight Group). The pre-operative, peri-operative, post-operative data regarding surgery and anesthesia were compared between groups. Mean weight was 3.9 ± 0.8 kg in the LWG and 7.8 ± 1.5 kg in the HWG. Children in the LWG were more prone to pre-operative respiratory management (40% mechanical ventilation and 42.9% oxygen therapy). The operating times (82 ± 28 min for LWG and 85 ± 31 min for HWG) and respiratory parameters during the procedure (PCO2) were comparable between groups. Post-operative complications were 1 gastric perforation with peritonitis and 1 small bowel obstruction in the LWG, 2 cases of gastric perforation with peritonitis in the HWG. Mean follow-up was 67 ± 44 months. Significant recurrence of GERD requiring a redo fundoplication was noted in 3 patients in the LWG and 1 patient in the HWG. 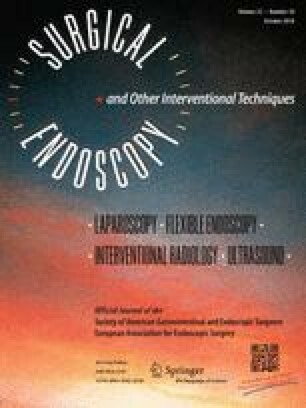 Laparoscopic fundoplication is a safe procedure in infants ≤ 5 kg without increase of post-operative complications, recurrence, or mean operative time. Dr. Claire Dupont-Lucas has received honoraria and reimbursed travel from Abbvie. Dr. Benjamin Menahem has received reimbursed travel from Sanofi Aventis. Dr. Julien Rod has received reimbursed travel from Wellspect healthcare. Drs. Thierry Petit, Philippe Ravasse, Jean-Baptiste Marret, and Camille Godet have no conflicts of interest or financial ties to disclose.